The normally overlooked race is turning out to be one of the most hotly contested contests this spring. 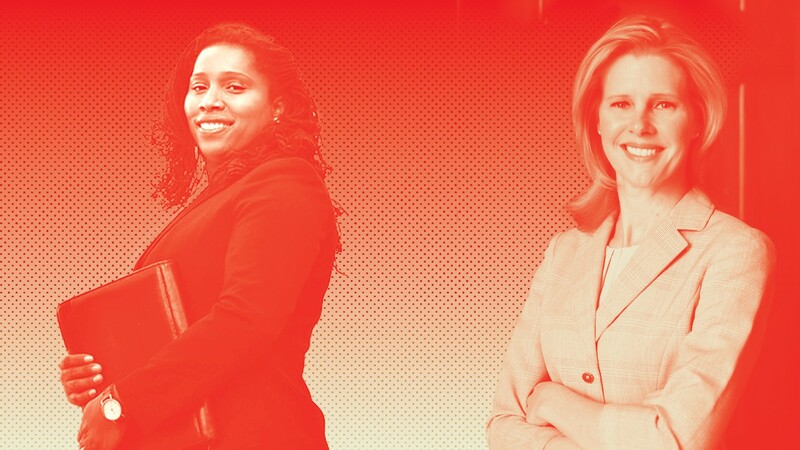 The matchup between Irella Blackwood (left) and Melissa Wilk is one of the fiercest battles of this election. Typically, the down-ballot race for county Auditor-Controller/Clerk-Recorder is a sleepy affair. Voters often don't know much about the candidates or what the job actually entails. But this June's winner-take-all campaign for Alameda County Auditor-Controller/Clerk-Recorder is turning out to be one of the fieriest battles in the June 5 election. Candidates for the position typically spend most of their time on the campaign trail explaining the duties of the Auditor-Controller. As the job title suggests, the role includes auditing the county's $3 billion annual budget, but it also involves issuing marriage and death certificates, overseeing property records, and paying the county's bills. This year's campaign offers an intriguing matchup between political insider Melissa Wilk, who apparently was hoping to get the job as the hand-picked successor in the county's "hand-off" system, squaring off against outsider Irella Blackwood, a member of the San Francisco auditor's office who is undergoing increasing scrutiny for her own personal financial missteps. In addition, a controversy over the ballot designations of both candidates — an issue that appears to be insignificant at first glance — could potentially provide the margin of victory in the race. The last three county-auditors have risen from within the office in what some East Bay political insiders call the "hand off." Four years ago, then-Auditor-Controller Pat O'Connell filed for re-election, but at the last minute, and without much public notice, decided to retire. Then, just prior to the filing deadline, O'Connell's lieutenant, Steve Manning, filed for the seat. Because O'Connell was an incumbent, three additional business days were tacked onto the filing deadline. But the short turnaround effectively precluded other candidates from putting together a campaign and thus greatly favored the status quo — Manning, who benefitted from having the job effectively handed off to him. The same scenario was expected to occur this year: Manning dropped out of the race at the last moment, allowing Wilk, a longtime deputy in the office, to quickly jump in the race in yet another hand-off. But this time, things didn't go as planned, because Blackwood jumped into the race, too. "I think there is a sense of entitlement with this county seat and other county seats, even though it's an elected seat — they seem to treat it like an appointed position," Blackwood said. "This is the people's seat, let the people decide." But then last month, as the candidates participated in public forums and sought endorsements from various groups, the campaign for Auditor-Controller took another turn: Word came that Blackwood's campaign had suffered the embarrassing indignity of bouncing the $1,900 check for her filing candidacy fee. Blackwood later said her campaign quickly replaced the check and blamed the matter on her hastily putting together the finance side of her first-time campaign. But Blackwood's campaign then took another hit when copies of her five-year-old, $4,000 delinquent property tax statements began to circulate around county political circles. The failure to pay property taxes threatened to derail her candidacy for a job in which the duties include auditing property tax revenues. Blackwood paid off the tax bill in 2013. She said the lone missed payment was the initial installment of her property tax after purchasing her home in 2007. She said she was not aware of the past due bill because her lending institution made the payments through an escrow account. "It was a miscommunication between my mortgage company and the county of Alameda," she stated. "I'm sure I'm not the first person this has happened to." In an interview, Blackwood accused Wilk's campaign of compiling and distributing opposition research against her in order to distract from her own record in the Auditor-Controller's office. "When you don't have any actual accomplishments, you run a negative campaign," Blackwood said. "This is an attempt to do a fake audit on me. It's cute, but it's a distraction from what needs to happen in Alameda County." But Wilk questions Blackwood's excuse for the bounced filing fee, noting that Blackwood filed an intent to run for the office in December, nearly three months before the filing deadline and thus had plenty of time to set up her campaign's finance arm. "I don't buy it," Wilk said. As for the property tax issue, "Five years went by. Those tax bills were mailed to that property, if she lived at that property, she got copies of them," Wilk added. "This is a person who is not personally fiscally responsible. How can she be responsible for $3 billion in taxpayers' funds?" The heated rhetoric between the two candidates has been evident from the start. Early this year, Wilk initially attempted to block Blackwood's use of the title "chief auditor/consultant" as her official ballot designation, arguing that it's misleading because Blackwood has not held the position in San Francisco City Hall for at least one year. "She was not the chief of anything over the past 12 months," Wilk said. However, Wilk decided to not follow through with an official complaint to the Alameda County Registrar of Voters. Instead, she submitted her own ballot designation of "chief auditor controller." Blackwood then similarly complained, noting that Wilk's official job title is actually "deputy auditor controller." "Does she think she's the only person in the world with that title?" said Blackwood. "To me, it's more of an insult that she does not believe in equality and she is questioning whether someone is equal to her given her sense of entitlement." For her part, Wilk says Blackwood's ballot designation worries her. Political candidates — especially in down-ballot races in which voters may not know much about the contest — realize that a ballot designation can often mean the difference between winning and losing. "It keeps me up at night," Wilk said. Blackwood is likewise concerned about the issue, especially after seeking an endorsement from a local labor leader, who erroneously believed Wilk was the incumbent based on her ballot designation. Some political consultants believe a good ballot designation can give a candidate a five-point advantage. Blackwood has attempted to fight back by putting the county Auditor-Controller's office on the defensive — as if Wilk is, indeed, the incumbent. From the beginning of the campaign, Blackwood has focused on the lack of performance audits done by the office in recent years. Such a review, typically completed to ensure that a government agency is providing enough bang for the taxpayers' buck, has not been done since before 2016 in Alameda County. In San Francisco, Blackwood gained notoriety for identifying excessively large payouts to some of the city's firefighters, unauthorized grants for the arts, and improper subsidies offered by the water department. Wilk said in an interview that the loss of a staff member for a period of time may have hindered the office's ability to complete performance reviews. In addition, she believes some were initiated, but not yet finished. Wilk also maintains that performance audits are only a small part of the job and the least technical. Blackwood has also slammed the county Auditor-Controller's office for making it difficult for residents to access public records. In one notable exchange during a candidate forum in Alameda, Wilk denied the assertion and said residents could merely fill out a Public Records Act request to gain access. But that's a somewhat onerous task that few people — outside of hardy activists and journalists — feel knowledgeable enough to complete. At subsequent events, Wilk has changed her stance and now supports instituting a more user-friendly website, if elected. In an interview, however, Wilk also stated that the lack of performance audits online has never been raised before. "It's never been an issue. "We're an AAA-credit-rated county from all three credit-rating agencies," Wilk added. "If we truly had a transparency problem or an internal control problem, they would have not upgraded us."